Doc Who Dalek Scarf Offer | Hey nerds! Wrong genre show, but the oncoming dark nights and cold snaps are an inevitability as we approach November. So it’s time to dig out your dusty old scarves in an effort to keep warm on the daily commute, or for when you’re on patrol in a graveyard with a trusty stake at your side. Oops, wrong show again. 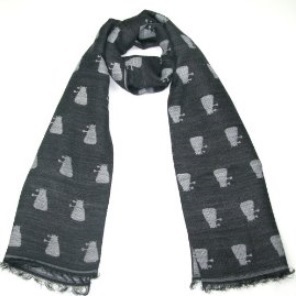 Thanks to the folk over at Lovarzi though, you’ll be able to keep warm in true geek style this winter with their dastardly decorated Dalek scarf – a must-have for any Whovian, surely? And even better, for TODAY ONLY, you’ll receive an extra 15% off this officially licensed product when you use code DALEK15D at checkout. Whether you’re the big fan in your household, or you know a Doc Who devotee who’d love to find this in their Christmas stocking, the time has come for Time Lord accessorising. Stay warm across space and time, kids! « Gaga: Pop Maverick or Art Pretender?